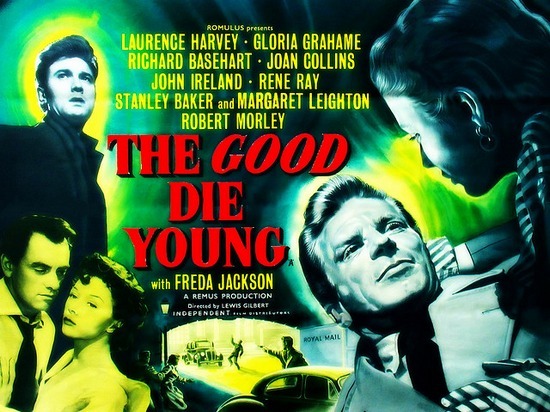 Tonight’s feature is THE GOOD DIE YOUNG , the film stars Laurence Harvey, Gloria Grahame, Richard Basehart, Joan Collins and John Ireland. Three good men – a broken boxer, an American veteran trying to win back his mother-dominated wife, and an air force sergeant married to a faithless actress – are corrupted by Miles Ravenscourt, an amoral “gentleman.” Because they need money, they let Miles lure them into his scheme to rob a postal van with a large cash cargo. This entry was posted in 1950s, Film Noir Friday and tagged 1954, Gloria Grahame, Joan Collins, John Ireland, Laurence Harvey, Richard Basehart by Deranged. Bookmark the permalink.